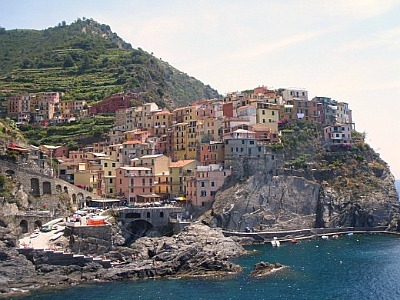 Riomaggiore is the first village of the Cinque Terre that one encounters when arriving from La Spezia. It is also the easternmost of the five, and one of the termini of the “Sentiero Azzurro” – the coastal path that connects all five towns in sequence. It is probably the second most important centre of the area after Monterosso (at the other end of the “Sentiero Azzurro”), a fact perhaps due to its being the most easily reachable of the “five lands” – at least since there is a railway line (this stop is literally a few minutes away from La Spezia Central by train). Riomaggiore's importance can be detected by the fact that it is relatively big (only Monterosso is bigger), and that it hosts a certain number of services, nowadays mostly connected with the presence of the National Park (which has here its headquarters); by the train station, a particularly welcoming visitor centre will also help you find your way around the Cinque Terre. 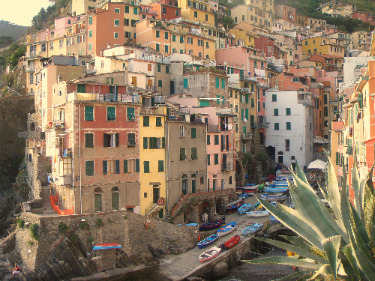 Having said that, Riomaggiore is quite interesting in its own right. Unlike Monterosso, it doesn’t have major monuments (even though the main church is not devoid of interest, and there are also the remains of a castle in the high part of the village, from which impressive views are commanded), but its strength lies in the striking beauty of its setting – something that you would not guess from the train station. Riomaggiore is basically a cascade of old houses, all tightly clustered around a tiny natural harbour carved out in between the rocks. Buildings are tall, as in Medieval times the lack of space was compensated for by constructing as high as possible (and if you have visited Genoa, you will likely be already familiar with this principle); the houses are also multi-coloured, and often bear frescoed façades, in the typical Ligurian style (below, an image of Riomaggiore's old houses). All in all, despite the high presence of tourists (which can be quite overwhelming in the summer and during other busy holiday periods), Riomaggiore still manages to look like a fishing village, and fishermen can be seen to this day mending their nets in the small harbour, where plenty of colourful fishing boats are also moored. The houses overlooking the harbour are literally clinging to the living rock – which makes the setting particularly picturesque; to the left (facing the sea), a small lane will lead around a rocky outcrop to a small secluded beach, and if you continue past that, it will take you uphill to Torre Guardiola, an area set up as a botanical educational facility by the Park, where you’ll see signs explaining the flora of the Cinque Terre. 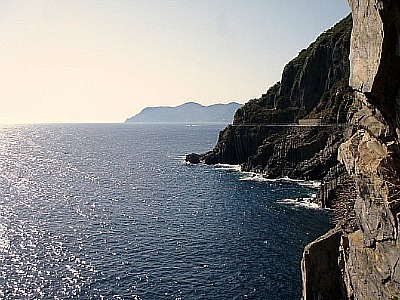 Should you reach Torre Guardiola itself, there you will find a small bar, right on the spot where a majestic view opens up on the other side of the promontory, on the tiny islets of Isola Palmaria (facing Portovenere – another beauty spot in its own right; below, a view from Torre Guardiola towards the Palmaria islet). But the main attraction in Riomaggiore is without a doubt its being the starting point of the so-called “Via dell’Amore” (which could be roughly translated as “Love Lane”), which is also the first stretch of the “Sentiero Azzurro” Coastal Path, leading up to Manarola in less than half an hour’s walk. Being flat, it is gently misleading, as it does not give away much of what’s to come after Manarola – and the rugged, uneven nature of most of the rest of the coastal path. In may not be obvious, but there is a hidden reason for this ‘deceitful’ appearance of the “via dell’Amore”: originally, this wide path was traced as a service road when the railway first arrived in the area in the 1920s. It was a stroke of genius to convert it into a fashionable promenade after that – even though, it has to be said, the “via dell’Amore” has lost a lot of its original charm. Prior to the institution of the National Park, the path had suffered badly from years of neglect, and for some time it had even become dangerous and therefore unaccessible. Refurbished by the Park, it is now fully open again, but due to safety reasons, it has lost the beautiful wrought-iron railings, originally painted blue. Luckily, though, the wonderful sights are unchanged, and while strolling on this very easy section of the path, you can enjoy views on the dramatic rock formations where waves powerfully crash, amid a sparse, coarse Mediterranean vegetation of agaves, spurges and other scented bushes (below, a view from the “via dell’Amore" looking towards Punta Mesco in the distance). Before you reach Manarola, just beside the train station you will get the chance of entering one of the Park's most interesting visitor centres. It allows an insight into one of the main endeavors of the National Park: the production of cosmetics, obtained in a natural way by using the properties of plants found within the territory of the Cinque Terre. Here, machinery for distillation and other processes are on display, and their functioning explained. Of course, it is possible to buy the finished products, and as well as the cosmetics, but there are also other local produce to choose from, especially food: the Park is actively involved in the production of typical items such as Olive oil, Limoncello liqueur (obtained organically from Monterosso lemons), sauces based on a local variety of basil (primarily, of course, the Ligurian pesto) and anchovies (there is a particular type which is called in Italian “acciuga di Monterosso”), plus a selection of pasta and biscuits. 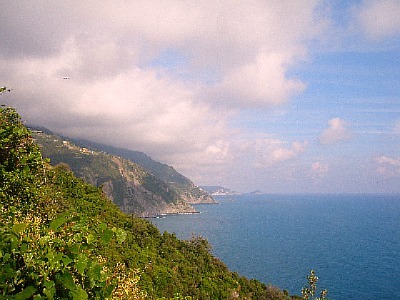 And above all, the Sciacchetrà, the sweet wine that has become the symbol of the Cinque Terre, which is produced from the vineyards that are all around you when walking in the area (in addition to that, there is also a dry white wine – simply called "Cinque Terre" – that goes particularly well with local fish dishes). This is a way in which the Park manages to put together different goals at once: on the one hand, selling local products naturally supplements funding for the upkeep of an area in which maintenance costs are unimaginably high; on the other, this in itself allows sustainable projects aimed at the direct management of the territory to be carried out – as it happens for instance with the vineyards near Corniglia (for more information on this, see the Vernazza page). If you have a specific interest on any of these local productions, there is the possibility of visiting a series of facilities, all connected with the park: for the Limoncello, the producing plant is along the National Road that connects Riomaggiore to La Spezia (just before the Biassa tunnel); for the Olive oil, the oil mill is in Volastra (above Corniglia); for anchovies, the “salting station” (a place where the raw material is worked – and they will explain you the whole procedure with the aid of a video) is in Monterosso. But should you wish just to do some shopping, all the finished products can be found here, in the Manarola Visitor Centre. 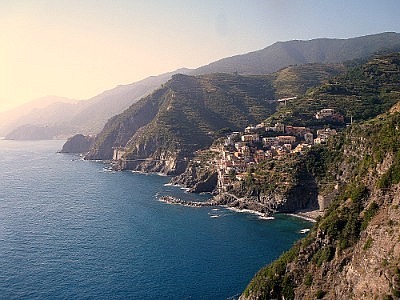 Back to our trail now, after the Visitor Centre a pedestrian tunnel will take you straight into the centre of Manarola, which is perhaps, together with Corniglia, one of the smallest of the Cinque Terre. Again, here you will find a tiny village all clustered around a rocky cove. Take some time to relax in the small harbour, and then enjoy the best view of it from the other end of the village as you leave it, looking backwards from the stretch of “Sentiero Azzurro” that would lead you onwards towards Corniglia. Should you be interested, it is also worth mentioning that in Manarola there is a small museum dedicated to the history of Sciacchetrà – the famous sweet wine just mentioned above. All in all, Manarola is a particularly nice spot in which to take a break if you are walking along the coastal path – a welcome resting place where you can get close to the roaring waves and, perhaps, find sustenance in one of the fish restaurants around the harbour (below, a view of Manarola's enchanting rocky cove).